Food security for all is a cornerstone of the United Nations 2030 Agenda, which recognizes that global sustainable development can only be achieved if hunger and all forms of malnutrition are eradicated (Sustainable Development Goal number 2). Nevertheless, the international community must be aware that food security does not only mean that enough food is produced and that all people have access to it. It is also fundamental that all food is safe for consumption. That is: there is no food security without food safety. Globally, food-borne illnesses affect 600 million people and cause more than 420,000 deaths each year according to an assessment by the World Health Organization (WHO). Children bear the most tragic toll, both in terms of mortality and due to stunting, which affects 150 million children under the age of five and is often caused by dangerous microbes or parasites that creep into their meals. Last year, for example, a lethal outbreak of Listeria was responsible for more than 180 deaths in South Africa, almost half of them young children. The contamination originated in a food-processing company that exported to 15 countries. The costs of unsafe food go far beyond human suffering. Contaminated food hampers socioeconomic development, overloads healthcare systems and damages economies, trade and tourism of a country. Economic opportunities of the international food market are lost to countries that are unable to meet international food safety standards. The World Bank reckons that food safety mishaps cost developing countries more than $100 billion a year. An increasingly globalized food supply means that risks from unsafe food can rapidly escalate from a local problem to an international emergency, exposing populations worldwide to food hazards. Many developing countries import a significant share of the food supply for their population, with some – such as the Pacific islands – relying almost entirely on food imports to ensure food security. Therefore, it is absolutely fundamental that countries invest in food safety. While many countries have sophisticated food-safety tools and systems, many do not. In the rapid evolution of science, technology and communication today, as well as changes in agriculture, environment and consumer behaviours, authorities everywhere need to keep vigilant, share information and resources, and find ways to make sure all stakeholders contribute to effective outcomes. Unfortunately, food-borne illnesses are particularly likely to spread via foods that have strong nutritional qualities – fibre-rich salad ingredients for example – and public fears about their consumption can lead to greater consumption of hyper-processed foods that exacerbate the growing global problem of obesity with an enormous toll on health and lives. The impacts of climate change are also undermining the safety of food. For example, the risk of aflatoxin – a carcinogen found in staple crops in tropical areas where hunger rates tend to be high –will expand as temperatures rise and rainfall patterns change. Mitigating such risks is vital, especially to vulnerable rural communities. Food contaminated with antimicrobial-resistant organisms can also be a source of human exposure. So the stakes are high, and there is no alternative to investing wisely and robustly in this area. In 2019, the United Nations Food and Agriculture Organization (FAO) has co-organized two major international conferences to discuss the future of food safety. The first took place in Addis Ababa, Ethiopia, on 11 and 12 February, in a partnership between FAO, WHO and the African Union. It highlighted the importance of food safety to fight all forms of malnutrition and to promote sustainable development. The second conference will take place in Geneva in April, which FAO is co-organizing with WHO and the World Trade Organization (WTO). It will address the importance of strengthening food safety standards for promoting international trade. FAO works in many fronts to promote food safety. One of the most important is the Joint FAO/WHO Food Standards Programme implemented by the Codex Alimentarius Commission, which is an international inter-governmental food standards setting body. Its standards are published as the Codex Alimentarius. This “food code” covers the entire production chain, allowing governments to establish science-based, internationally acceptable standards in order to establish criteria for food to ensure safety and harmonize trade food despite new challenges and threats that continue to emerge. Codex has worked on food safety and trade for over 50 years. Since 1963, Codex has developed hundreds of internationally recognized standards, guidelines and codes of practice. It has been recognized by WTO since 1995 as the benchmark standard for national food safety regulations and the basis for international food trade. Codex is, therefore, the invisible link between those working in the food supply chain and the consumer. FAO also assists countries in drafting or amending legislation relevant to food safety and quality, as well as in providing assistance through legal and institutional assessments; supporting legal reform processes; and promoting capacity development activities for lawyers and regulators. Food safety requires a participatory approach. From production to consumption, safeguarding our food is a shared responsibility. We must all play our part. 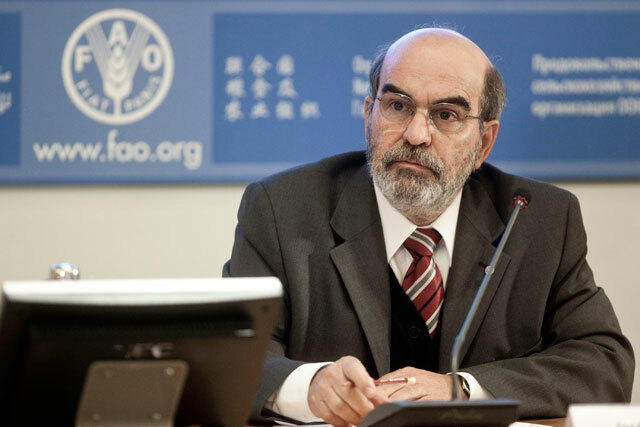 José Graziano da Silva is Director General of the Food and Agriculture Organization of the United Nations (FAO). He is also a founding member of Brazil’s leftist Workers Party Brazilian American agronomist and writer. As a scholar, he has authored several books about the problems of agriculture in Brazil.